Introducing... millet! - Eat this. It's time for a new entry in my Whole Grains 101 series. I've decided to feature millet this time. This was one of the grains that I had never eaten before I began exploring more whole grains last year. I quickly fell in love with its texture and ability to absorb any flavor. Millet is one of the least popular grains and it is often left for the birds (quite literally!). That's a shame because I think it would become popular if people gave it a shot (I like it more than quinoa, which seems to have achieved fad status lately). To start us off, here's a cool fact: millet is often used to fill juggling beanbags (I'm tempted to tear my old ones apart to confirm this!). 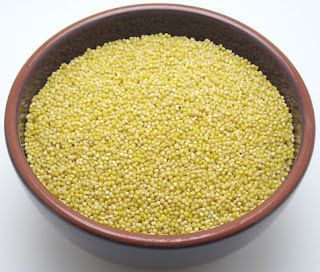 Millet is an ancient grain that is widely used in parts of Asia and Africa, particularly areas with a very hot climate. It's a small grain that looks somewhat like a bead. There are several varieties (and colors), but usually only one type is found in the U.S. - it's simply hulled and is an off-white/grayish color. What does millet taste like and how is it used? Millet doesn't have a strong flavor; it has a hint of sweetness, and perhaps a bit of nuttiness, but it's much like white rice and quinoa in that it takes on the profile of the ingredients that are cooked with it. If I'm using it in a recipe without bold flavors, I usually cook it in meat or veggie stock to give it more body. The great thing about millet is that you can use it in just about any recipe. I love it as a rice substitute (in stir-fries, to stuff vegetables, or as a simple side dish) because it fluffs up and has a texture that is very similar. Traditionally, it's often eaten as a porridge or its flour used in bread (such as roti and chapatti). It can also be the basis of a salad or added to soups or casseroles. Go crazy with it! Where do you buy and store millet? Like all of my whole grains, I buy millet at my local co-op or natural foods store. It's also available at Whole Foods, if you're lucky enough to live near one. I usually buy it out of the bulk bins because its cheaper and I can get the exact amount that I want. If you can't find it in these places, there are many sources online, such as Bob's Red Mill and Arrowhead Mills. If you have room in the refrigerator or freezer, store it in an airtight container in there. If not, keep it at room temp but try to use it within a couple of months (but again, make sure it's in an airtight container). I have also had success freezing cooked millet, but this isn't as important as it is with other grains because millet cooks quickly. First, pick through your millet and discard any rocks or debris, and then rinse it well under cold water. Usually I remember to toast my millet, which involves letting it cook over medium heat in a saucepan for a few minutes, until it begins popping (but this step isn't absolutely necessary). Then I add 2 1/4 cups water (or stock), a pinch of salt, and about a teaspoon of olive oil for every cup of dry millet. Once this mixture comes to a boil, I reduce the heat to low, cover the pot, and let it simmer until all of the water is absorbed (about 15 min). If it's too dry, stir in a little bit more water and continue to cook for a few more minutes. Ideally I let it sit covered for a few minutes off of the heat before I serve it, but I'm not always that patient. One cup of dry millet will produce about 4 cups when cooked. Substitute millet in any recipe that calls for rice or quinoa. It'll be a fun experiment! 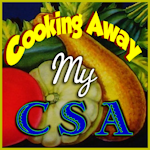 And make sure to let me know what you think and share recipes that you like. Hopefully I can find a few millet friends out there :). Suresh - I'm glad you stumbled upon my blog and are enjoying this post! It's always fun to find others who are experimenting with new whole grains! I actually just used millet in my casserole for dinner! I chanced on your blog, looking for a teff porridge recipe. I know this is an older post, but I wanted to let you know that you have another millet buddy! And I agree, it is great in the place of rice. I usually use brown rice in the casserole I made tonight, but was out. I actually think millet is less obtrusive! Really makes for a smooth dish. L-L-L - It's great to hear from another millet lover! I found your blog while looking for recipes for millet. I found that and so much more! I've also changed my eating habits after reading "Animal, Vegetable, Miracle" as well as "In Defense of Food." The biggest impact on me so far as been the movie "Food, Inc." About three years ago I started writing a blog called Test Drive Kitchen which has highlighted my family's shift from processed food to more whole foods. It has been quite a journey. My husband and I have never felt better in our lives. Now that I'm a mom, too, I'm taking so much joy in showing my son how to eat whole grains (Yay for Lorna Sass! )and veggies (Yay for Mark Bittman!) His favorite is anything with quinoa in it. Today, I'm going to try preparing millet for the first time and will definitely blog about it and include a link to your blog. Thanks so much for all the time you put in and sharing your food adventures! Karen - I love hearing from people who have gone through the same changes in eating! I hope you enjoy your experiments with millet, and I can't wait to read about it on your blog. how long will millet hold after the use by date? just health - As long as it doesn't smell rancid, it should be fine. For longer storage you can put it in the fridge or freezer, but it lasts quite a while at room temp, too.